Mon. #2 is HERE. Please follow us on Tumblr or Twitter, subscribe to us on YouTube or like us on Facebook. Don't miss Ian Clark's SmackDown Live Recap at 8 PM ET! With the cheap plugs out of the way here's Tuesday's latest wrestling news. 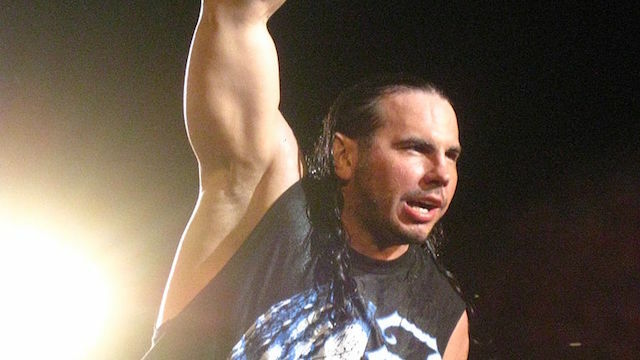 In this interview Matt Hardy talks about the addiction issues he's faced: "I was straight and narrow for the longest time. When we first started in WWE, we didn't drink, didn't do anything. We were both on the straight and narrow and a lot of the old-timers and the veterans made fun of is because of it. In '07-08, that time when I had about ten years there, we had done so many matches and even on top of doing those matches like the ladder matches, table matches, cage matches – even being on the road and that grueling schedule day in and day out and not sleeping correctly and taking bumps every night, night in and night out, it's not healthy. It's not what the human body is meant to do. It kind of came to a point where I was having issues. I was at a point where I really couldn't take off because I was in a spot or a slot that was good and gonna continue to get better. That's where it starts, just so you can kind of get through the match. There's a muscle relaxer and there's a pain pill, so you can kind of get through and then you can heal up over the weekend and try it again next week, or whatever it might be. That's where it initially starts and then you get to a point where if you get frustrated in life, once you kind of get into a cloud of pharmaceuticals or whatever it is, you almost kind of don't want to feel bad anymore. I want to feel good. That's where it becomes a real issue. The whole thing with pain pills and pain medication and managing pain in that manner, if you're someone who is in constant pain is a very slippery slope." Speaking to the Miami Herald, Ricochet is sure that Roman Reigns will return to WWE: "Reigns is a real-life superhero. He is the standard of like what, not just a sports entertainer should be, but like what a person should be. Just from the stories I've heard and the little bitty interactions I've had. Just watching him on the screen, he goes out there every single night and he puts his body on the line like not a lot of people can, and he delivers every single time. It's sad to hear, it's sad to see whenever someone like that has to not just relinquish the title, but stop doing something that they love. But, I know if anybody is gonna get through this, it's gonna be him. He's such a strong person, such a strong dude. I know he's gonna kick this thing's but and come back stronger than ever." SmackDown GM Paige has decided to "honor her word" - which in reality means the writers have scripted her to look good by booking Tye Dillinger for a title shot against Shinsuke Nakamura tonight since Paige had previously promised him an opportunity at the United States title. In addition a member of The New Day will face a member of The Bar/Show in a "Trick or Street Fight" while Daniel Bryan and AJ Styles will meet before the-show-I-won't-mention-by-name. As noted in last night's WWE Raw highlights, John Cena was replaced at the-show-I-refuse-to-name by Bobby Lashley, as Baron Corbin decided to "reward" Lashley for attacking Finn Balor earlier. This is of course all to cover for the fact that Cena refused to go to Saudi Arabia, and I for one don't blame him. Ronda Rousey vs. Becky Lynch has been booked for Survivor Series.